From Goodreads – Kara is a high school junior who’s loving life. She’s popular, has a great group of friends and an amazing boyfriend, and she’s a shoe-in for homecoming queen. Even though her parents can’t stop fighting and her ex-boyfriend can’t seem to leave her alone, Kara won’t let anything get in the way of her perfect year. It’s Friday night, and Kara arrives at a party, upset after hearing her parents having another one of their awful fights, and sees another girl with her hands all over her boyfriend. Furious, Kara leaves to take a drive, and, as she’s crossing an intersection, a car comes out of nowhere and slams into the driver’s side of Kara’s car. When Kara wakes up, she has no memory of the night before. Where is she? Why are her parents crying? And, most importantly — why can’t she feel her legs? As Kara is forced to adjust to her new life, where her friends aren’t who they seemed to be and her once-adoring boyfriend is mysteriously absent, she starts to realize that what matters in life isn’t what happens to you — it’s the choices you make and the people you love. 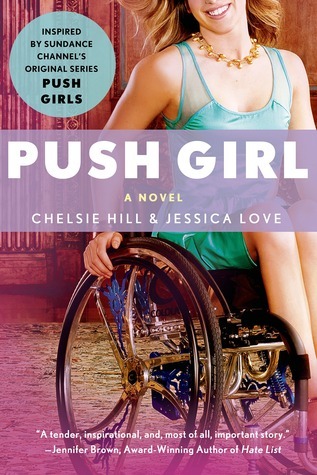 Co-written by “Push Girls” star Chelsie Hill, whose real life closely mirrors Kara’s experience, this novel will open the eyes of readers everywhere who have never met someone who lives with paralysis. Oh, this book! I have so much love for it — not to mention its co-author, my friend and fellow Bookanista, Jessica Love. I cannot wait for June 3rd, when the world will finally meet courageous, determined Kara and her fabulous friends! At first glance, Push Girl is simply an issue book. Kara’s been dealt an incredibly challenging hand and she’s facing all sorts of struggles, struggles the average person’s probably never even considered. But this novel is so much more than the issues it covers. It’s a hopeful, honest, uplifting story about change and friendship and taking a stand. It’s about healing and traveling unexpected paths and — while Kara hates this word — it’s inspirational. Kara is such a likable protagonist. While she goes through (understandable) stages of grief and anger and self-pity, she’s ultimately a tenacious girl with an unshakable spirit. Kara’s fight to come to terms with her paralysis is heartbreaking, hard to read at times, but there’s so much joy during the scenes in which she preservers, changing peoples’ minds about paralysis, what it means to be different, and the true meaning of the word inspirational. Kara’s cast of supporting characters is fantastic as well. Jack, especially, makes me smile, and Amanda’s loyalty is refreshing. Push Girl will appeal to teens and adults alike. It’s emotional and deep, but there are moments of fun, too. Plus, it’s incredibly well-written. Do pick it up when it becomes available June 3rd — I think you’ll love this debut as much as I do! Yes to all of this! I loved this amazing book. I cannot wait to get my hands on this book 🙂 It really sounds amazing. Plus Jessica co-wrote it and you recommend it…so it´s a no-brainer! It’s awesome, Elodie… Can’t wait for you to read it!